LiPo batteries are a relatively new type of battery that is often used in electronic devices. They tend to bring more power to the table, but their run times can also be limited when compared to other batteries. This is why you need to have a LiPo charger to recharge the batteries as they lose their power, especially if you are an individual who likes to run radio controlled helicopters or other similar devices. 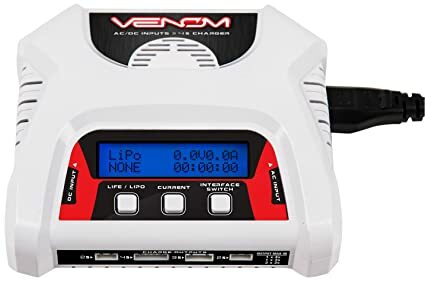 If you are looking for a LiPo charger, chances are that you are searching for one online, which means that you do not have a knowledgeable sales representative to help you figure out which one will fit your needs the best. We have created this guide to fulfill the job of presenting you with the research that will help you purchase a charger that will serve you well for years to come. Take a look at our reviews and our pre-purchase considerations to see what you think. Tenergy has been creating innovative batteries and battery chargers since 2004. 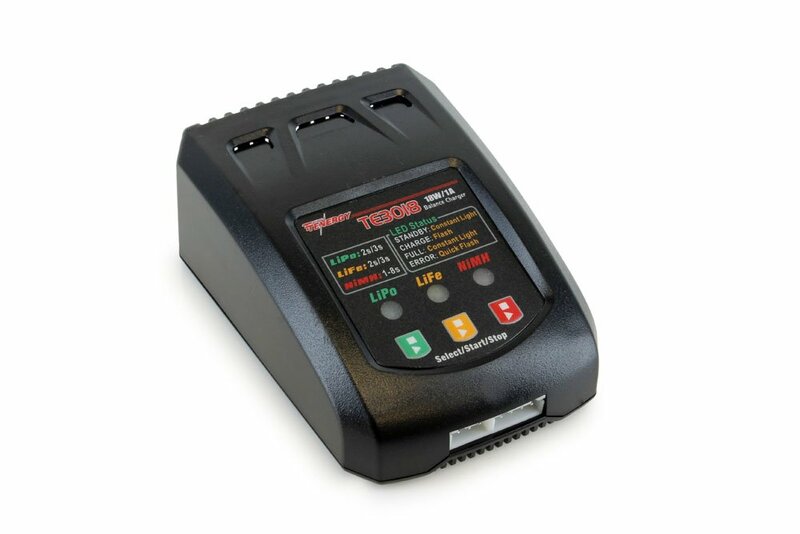 The TB6-B charger is one of the top of the line chargers that have come from this company. It is designed to provide a balanced charge to several different types of batteries, which include LiPo, NiMH, NiCd, Li-ion, LiFe, and SLA batteries. With a NiMH and NiCd battery pack, you can charge at up to a maximum of a 15S cell. With a Li-ion, LiPo, or a LiFe battery pack, there is a possibility of having a cell support of up to 6S. With this charger, the maximum charge current is 5A, and the maximum discharge current is 1A. In addition, the battery is able to store up to five different programs that will allow you to quickly access a setting and charge the battery that you need to have charged. The LCD screen on this charger is not backlit, but it does give you a convenient display that shows you what the current life of the battery that you are charging is as well as the charge of each individual cell within the battery. This unit supports Hitech, JST, Deans, Mini Tamiya, and Tamiya connectors. It has a fast charging mode that is available if needed as well as a storage mode that can be entered when the battery is fully charged. There is a safety feature included in this model that turns off the charger when the batteries are fully charged; however, there is not a temperature sensor on this device. This means that you will not have a warning to let you know that the unit is overheating, but this charger is compatible with Tenergy temperature sensors and battery monitors if you wish to have those features. SkyRC has been making devices to accommodate RC hobbyists since 2008, and our silver pick is one of the quality chargers that the company manufactures. It is a device that is compatible with LiFo, Lilon, and LiFe batteries, and it even has a function that allows you to test the voltage of each cell in those three battery types. It also has a resistance meter that allows you to test the battery resistance level and see where the cell life of each battery stands. The unit features a LCD display that has a blue backlight that makes it easy to see the information being displayed even in low light situations. This unit is capable of supporting a current range from 0.1A to 6.0A. In addition, if you typically charge multiple battery types, you will be happy to know that the device can save up to ten different profiles that you can quickly access each time you need to recharge a certain type of battery. There is also a safety timer that is available for you to set, which will automatically turn the unit off. You can set this timer from 1 minute up to 720 minutes, so there is a lot of customizability with this charger. The packaging includes a mini charger, a banana connector, a DC cable with an alligator clip, a T plug with an alligator clip, a T plug with a Futbara connector, a JST connector, a XT60 connector, and a RCLITE mini USB light. 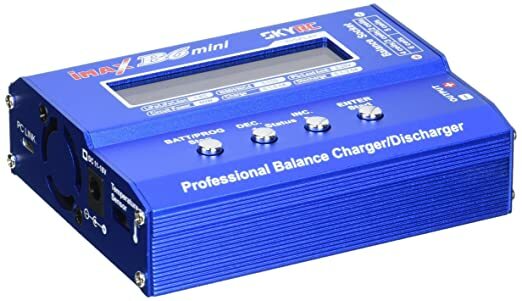 When it comes to the reviews for this SKYRC charger, 86 percent of the users who rated this product gave it a positive review with at least a four or a five star level. In fact, 83 percent of those reviews were actually given five star ratings. Venom has been creating batteries and battery chargers to keep your RC hobbies alive since 2001. Today, they are a leading company in the world of charging technology, which makes it easy to see why their LiPo battery charger was selected as the bronze pick on our list. It utilizes two to four cell batteries that are either LiPo or LiFe batteries. One feature that is convenient on this device is the fact that you can charge two batteries at the same time. It can even be a two cell LiPo battery and a two cell LiFe battery if that is what you desire. The LCD screen is a two and a half inch display that features backlighting that is blue, which is easy to see in almost any type of lighting. The display will automatically show the cell count and the life remaining of each cell. The device supports JST-XH 2.5 port connectors. It has an auto shut off feature that you can set to turn off when the battery that you are charging is full, and there is also a temperature protection feature that is designed to automatically turn the device off when it reaches a certain temperature, which will prevent the unit from overheating and burning out the cells in the batteries that you are trying to charge. As stated with our gold pick, Tenergy is one of the leading manufacturers in battery charging technology, so it is really no surprise to see them on our list twice. Their TE3018 is the perfect solution for someone who is ballin’ on a budget. It is an option that has a lot of the features that are important to a good LiPo charger and it is available at a low price point that anyone can come to appreciate. This device is designed to support three different types of batteries, which are LiPo batteries, LiFe PO4 batteries, and NiMH batteries. If you are charging either LiPo of LiFe batteries, you can charge two to three cells, but if you are using NiMH batteries, it is compatible with a one to eight cell count. This device has a charging rate of A1, which is designed to charge quickly, but not so quick that it overheats the battery. This unit is compatible with both a Tamiya connector and a mini Tamiya connector. The LED display is located on the front of the device, which is designed to inform you what the current status of the battery that you are charging is. When the light is flashing it is charging, but when it becomes a solid light, that means that the battery is fully charged. In addition, there is also an auto shut off feature that will turn the charger off when the batter life is full. Some chargers use simple plug and charge technology that does not require much effort on your end, and that is great for those of us who don’t care to have control over the device, but for those who are more technically minded individuals, you may desire a programmable option. Most of the higher quality chargers that are available on the market today are programmable devices, which means that you will be able to select the type of battery that can be charged, the current being sent to the battery, and the amount of time you want the battery to be charged. Most chargers that have this capability will monitor your batteries cell count and condition to make sure that it is charged safely and efficiently. If you have enough in your budget for a programmable charger, you will not regret selecting a device with this capability. Each battery charger has a maximum and a minimum cell count that the device can handle. Make sure that the LiPo charger that you select can support a range of 1S to 6S. In addition, most batteries have a maximum charge rate that is safe. In most LiPo batteries that rate is 1C, which prevents the battery from overheating and quickly diminishing the life of the battery. In most situations, the manual included with the charger will recommend the best charging current to use, anything under that amount will cause the charging time to increase. Not all chargers come with a power supply, so it is important that you also have a power supply that is capable of producing enough output to reliably charge your battery. To accomplish this, you must make sure that the power supply is at least 50 watts. Having 60 watts is better for a LiPo charger, but if your outlets will not supply 60 watts, then a 50 watt power supply will be sufficient. 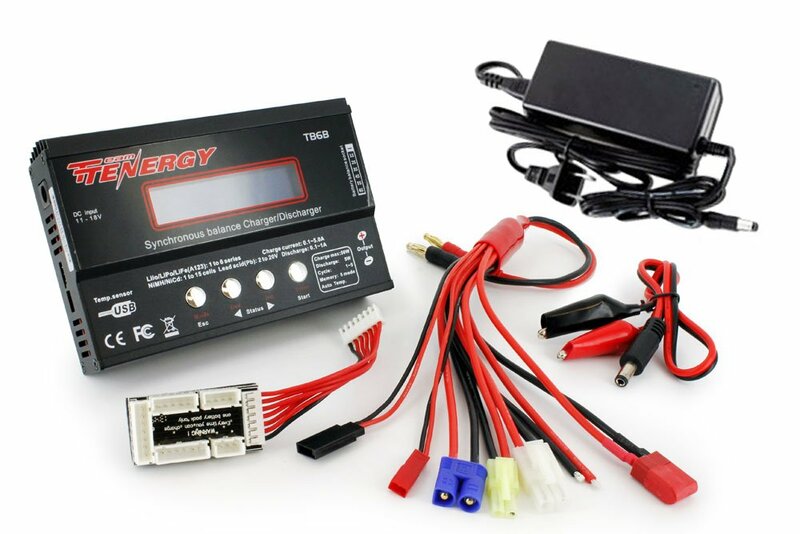 In addition, some chargers are designed to only charge one type of battery, which in this case would be LiPo batteries; however, there are also options that are more versatile. If you can find a battery charger that is capable of other types of batteries such as NiCad or NiMH, it may be a valuable asset to have at a later time. • A cell count confirmation to make sure the battery is able to be charged. • Voltage protection to prevent surges from occurring. • Temperature protection to ensure that the device does not overheat as it is charging. • A feature that stops the unit from charging when the battery is at full power. • A buzzer that will give you a clear indication that something is wrong and requires your attention. • A backlit LCD display that will be easy to see in low light situations. • A precision voltage reading that is available on an easy to read display. • A storage functionality that you can make use of when the battery is fully charged. • A programming profile that allows you to save your settings for the next time you need to charge your LiPo batteries. 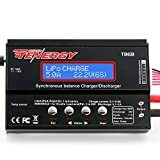 • The ability to connect the LiPo charger directly to your computer and watch the stats update as the unit is charging your batteries. 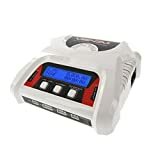 Now that you have a better idea of what a LiPo charger is and what features are important to have on one, you can efficiently select a model that is perfect for your needs. Hopefully, you can simply select one of our top picks, but if they are not your cup of tea, then there are plenty of other options on the market that you can look into. Whichever LiPo charger you select, whether it has fast charging capabilities or it is a more budget friendly option, you will be able to enjoy using your freshly recharged electronic devices in no time.